On 25th May 2016 the House of Lords held its fifth day of debate the Queen’s Speech. During the debate the Bishop of Newcastle, Rt Revd Christine Hardman, gave her maiden speech, becoming the second female bishop to speak in the House of Lords. As well as introducing herself to the House she addressed the Government’s life chances strategy, and regional growth in the North. Her speech is below in full, alongside responses from Peers. The Lord Bishop of Newcastle: My Lords, the theological understanding of grace is of the love and mercy given to us by God because God desires us to have it, not because of anything we have done to deserve it. In these early days in your Lordships’ House, it is grace that I have experienced—wonderful kindness and a warmth of welcome from your Lordships, the staff and all who work in this place. It has been entirely undeserved but a truly heart-warming experience. It will be no surprise to your Lordships that one of the loveliest and warmest welcomes came from the late Lord Walton—a fine and godly man, and a distinguished son of the north-east. “Every parish priest and bishop knows what it is to care for the whole community. It is a great aim for the Government, as set out at the start of Her Majesty’s gracious Speech, to, “legislate in the interests of everyone in our country” and, “adopt a one-nation approach”. The success of that will be one of the measures by which the Government are judged. On 2nd June 2015 the Bishop of Salisbury spoke for the first time in the House of Lords. 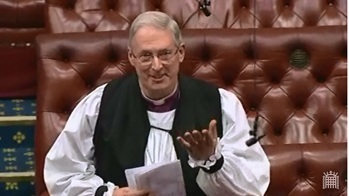 In his address, which came during the debate on the Queen’s Speech, he spoke of his background in the Church of England, his diocese, and his interest in the environment, climate change and energy. The full text is below and can also be watched online here. 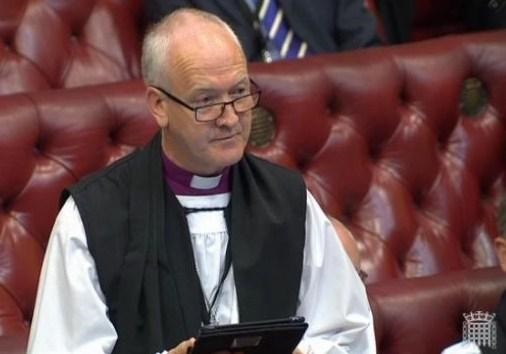 On 1st June 2015 the Bishop of Leeds spoke for the first time in the House of Lords. In his address, which came during the debate on the Queen’s Speech, he spoke of his background in the Church of England, his diocese, constitutional change, Europe and how economic and devolution proposals might impact on places such as Bradford. The full text is below and can also be watched online here. On the 22nd January 2015 the Bishop of Southwark gave his maiden speech to the House of Lords on the subject of the Local Government Finance Settlement. Bishop Christopher introduced himself his interests to the House in the usual manner before turning to address the debate. Speaking about the importance of local government Bishop Christopher addressed the impact cuts to funding have on people in greatest need, the importance of early intervention alongside the ease of losing sight of people in need during complex financial discussions instead of focusing on ensuring human flourishing. The Bishop was formerly welcomed to the House in the usual manner by Baroness Donaghy and the Mininster Lord Ahmad. The Lord Bishop of Southwark (Maiden Speech): My Lords, I address your Lordships’ House on this first occasion with some trepidation. As I was advised not to drift into preaching mode, I will resist the temptation to expound on the interesting passage from scripture that the noble Lord has just quoted.